Metallic thread gives these dragonflies their glitter. Stopping at a thread rack these days is like visiting a candy store-there are so many delicious embroidery threads to choose from. All of these choices can be intimidating, even to the seasoned embroiderer. But experimenting with threads can expand your color and texture palettes and add new life to your designs, whether you do free-motion embroidery or use a computerized embroidery machine. Here’s a look at the threads available to the home embroiderer and tips on how to use them successfully. Thread, like fabric, is made from either synthetic or natural fibers, or both, and each has its own appeal. 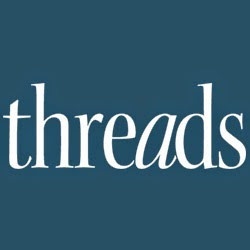 For examples of the threads mentioned here, see Threads types and brands. Rayon thread-This thread is the most popular choice overall because of its attractive high sheen, widespread availability, and consistent trouble-free performance, holding up to high-speed stitching without breaking or fraying. Rayon thread comes in a wide range of solid and variegated colors, as well as in a new “twist” thread composed of two or more solid colors twisted together to form a single strand, which adds automatic shading and dimension to flat designs. Most rayon threads are available in a standard 40 wt. and a thicker 30 wt. (in terms of thread sizing, the higher the number, the finer the thread). Rayon thread is readily available in standard size 40 wt. and a thicker size 30 wt., as well as in a wide range of colors. Brands include Coats & Clark, C & C ColorTwist; The Finishing Touch; Gütermann; Isafil; Madeira; Megasheen; Mettler Silky Sheen; Mez Alcazar; Robison-Anton; Scansilk; Signature; Sulky; and Sulky Ultra Twist. 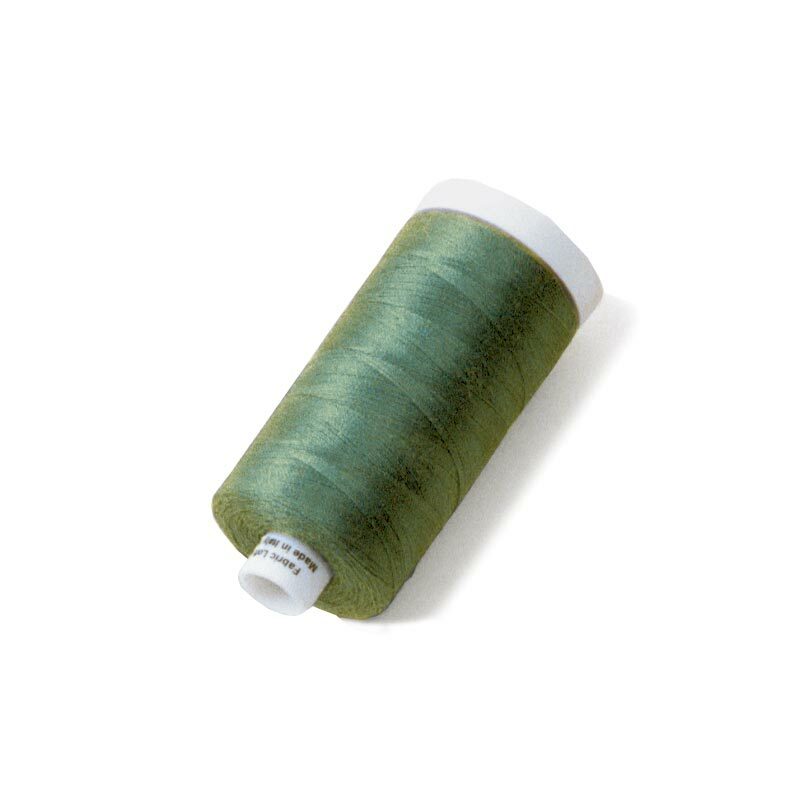 Polyester embroidery thread-Popular and economical for embroidery, polyester thread provides an effect similar to rayon and comes in various colors. It won’t shrink, fade, or bleed, so it’s great for children’s clothes. Rayon thread has a slightly higher sheen than polyester thread, but the two are interchangeable and perform similarly without breaking or fraying. When they’re combined in a single design, it’s hard to tell the difference. Polyester thread is economical and colorfast, even holding up to chlorine bleach. Brands include Coats America Sylko, Isacord, Janome (acrylic), Madeira Neon, Mettler Poly Sheen, Robison-Anton Polyester, Sulky Poly-Deco, and YLI Ultrasheen (acrylic). Cotton embroidery thread-Cotton thread is often overlooked for use in automatic embroidery machines. However, it performs beautifully and has a lovely, soft sheen. It’s available in weights up to a very fine 100, which is considered heirloom quality. But finer threads tend to be weaker, so 30- or 50-wt. cotton thread is more appropriate for machine embroidery because it’s stronger and provides better coverage. 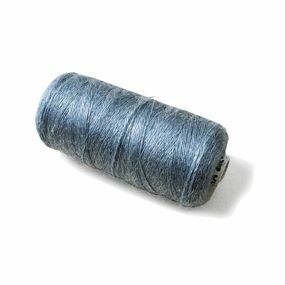 Silk thread-Silk absorbs dyes more brilliantly than all other fibers, and is truly the aristocrat of specialty threads. It combines the strength (but not abrasiveness) of polyester and the stability of cotton, and sews smoothly without breaking. It has a distinct sheen unmatched by any other thread. Silk threads are available in a wide range of sizes, but the 30 to 50 wts. 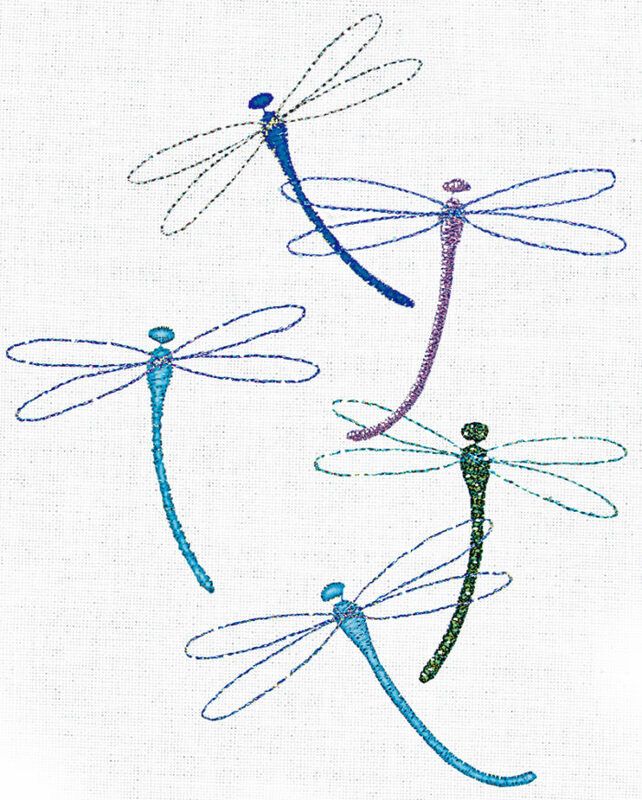 are the most appropriate for machine embroidery. They are more costly and not as readily available, but well worth considering, especially for embroidering on luxurious fabrics. 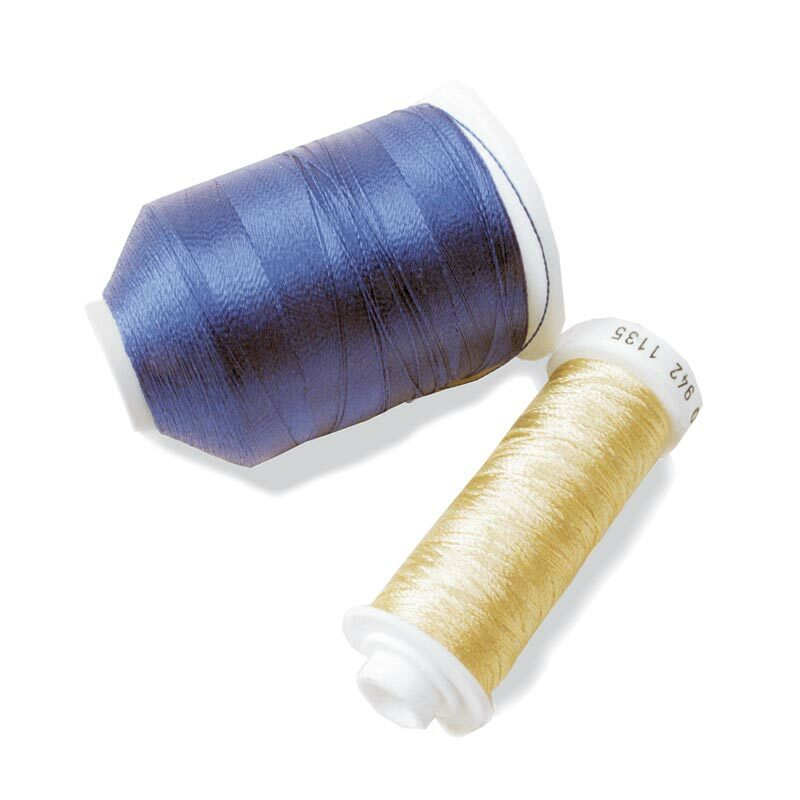 Silk thread is the top choice when embroidering on silk and other luxurious fabrics. It is made by Janome, Tire, and YLI Kanagawa. 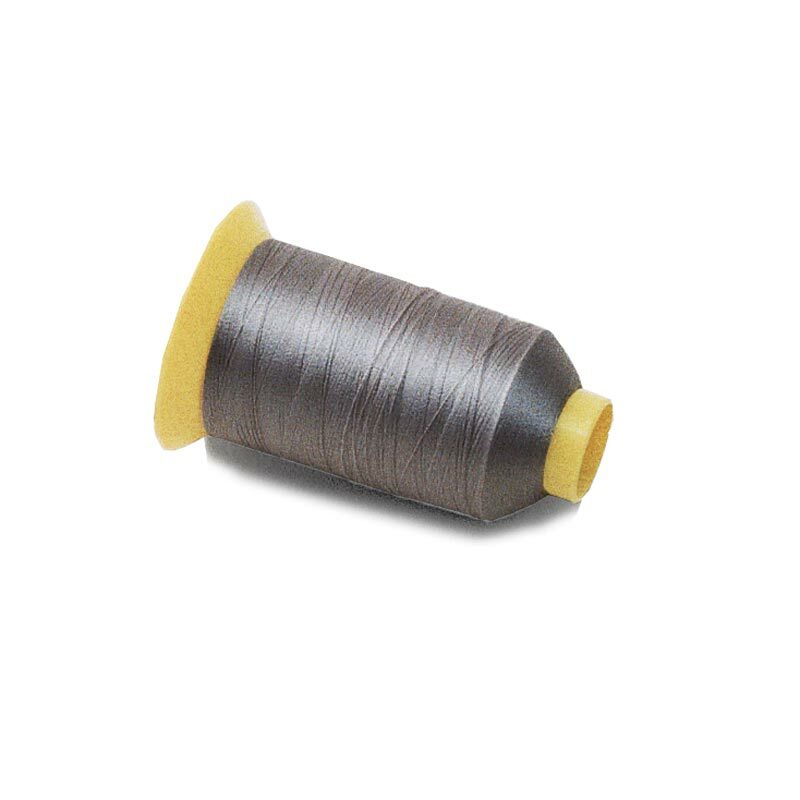 Metallic and mylar embroidery threads-Metallic threads are manufactured with a center core that is wrapped with metal foil or thin slivers of metal foil. Color is then applied by adding a polyester film to the foil. The most durable and desirable metallic threads have a coating of rice paper pasted over the center core, which binds the core to the metal, preventing the metal from being stripped away. In some threads, the foil may be coated with a silver alloy for added strength, and sometimes the polyester film is applied as an undercoating rather than a topcoating, to keep the color from flaking off. Considering the complexities of manufacturing metallic threads, it’s understandable that some might perform better than others. In fact, no words evoke as much emotion from machine embroiderers as metallic threads. Sewers either love the results these threads provide, or cringe at the thought of using them because they require a little kid-glove treatment, which I’ll discuss in a moment. Experiment to find the metallics that are the most trouble-free in your machine, and you will find they’re well worth using. 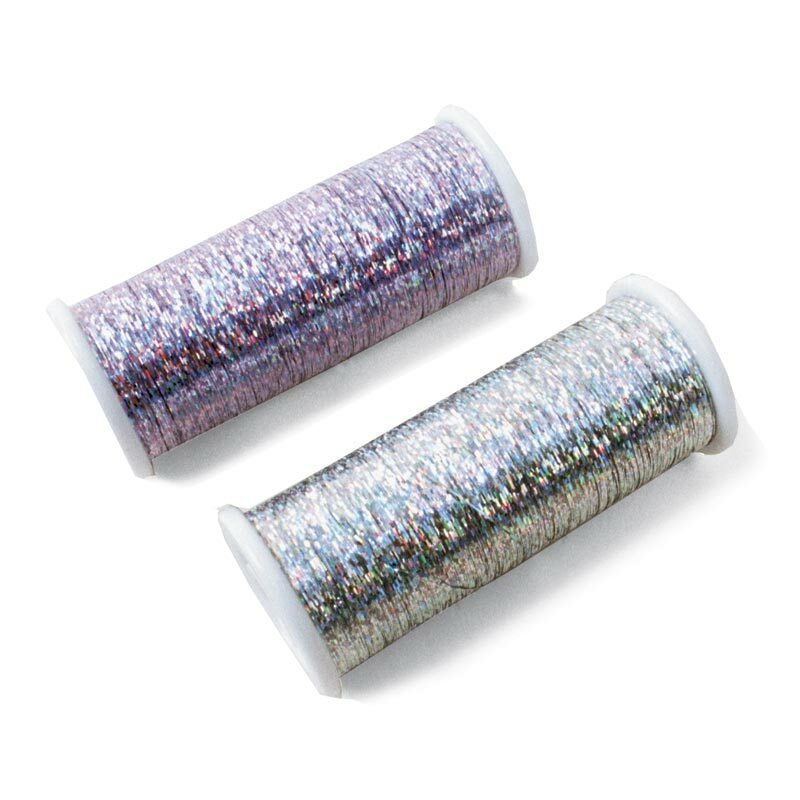 Metallic thread requires more care in handling than rayon or cotton thread, but it’s a popular choice for adding sparkling accents to embroidery designs. Available brands include Coats & Clark Metallic, FS/Jewel, Madeira Heavy Metal, Madeira SuperTwist, Mettler Metallic, Robison-Anton Metallic, SCS Madeira Soft Metallic, Sulky Metallic, Superior Threads Metallic, Signature Metallic, and YLI Fine Metallic. Glittery mylar threads are made from plies of film layered together, then cut into slices to form a flat filament thread. As with metallics, various aspects of the manufacturing process-for example, the number of plies used, amount of elongation or stretch inherent in the raw material, and width of the film slice-affect thread quality. These threads are manufactured to be much stronger than they originally were, but because they tend to break with high-speed sewing, follow the special handling tips below. Mylar threads are available in a wide range of colors as well as holographic hues, which pick up light and color from surrounding objects and add spectacular luminous accents to machine embroidery. Brands on the market include Glissen Gloss Prizm, SCS Madeira Jewel, Sulky Sliver, Superior Threads Glitter, and YLI Kaleidoscope. 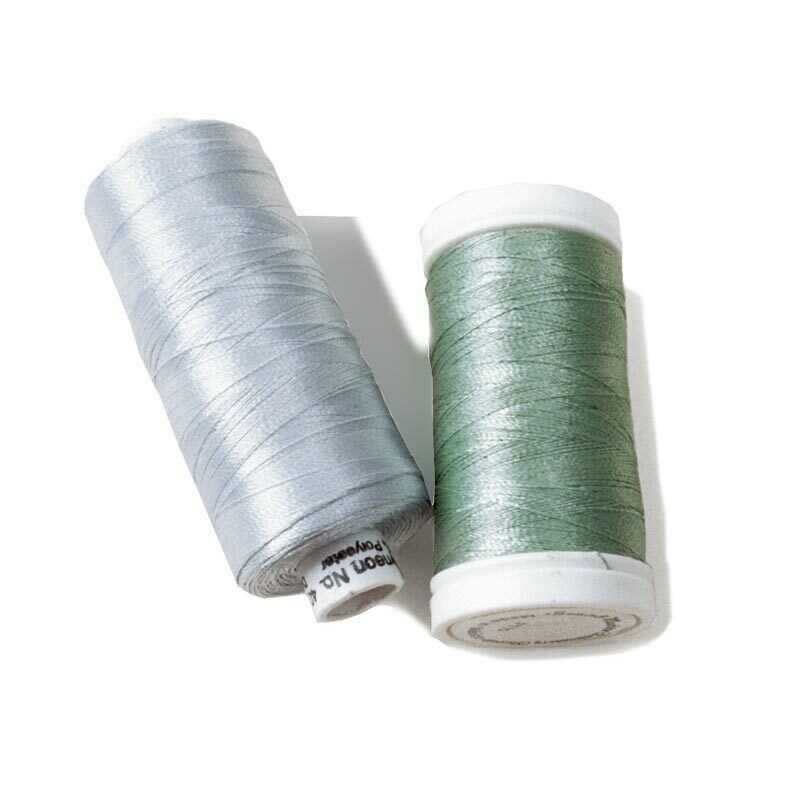 Metallic thread. Mylar thread. Special-effect thread. Special-effect embroidery thread-There are numerous special-effect threads, from a fuzzy acrylic/wool-based variety, which creates an old-fashioned crewel-like effect, to fluorescent neon threads. Some threads change colors when exposed to sunlight, and others glow in the dark. If you have performance problems with any of these threads, follow the special handling techniques discussed next. Brands to consider include Madeira Fluorescent Neon, Madeira Hologram, Superior Threads NiteLite, Superior Threads Sunspot, YLI Glo-Bug, YLI Monet (acrylic-wool), YLI Reflections, and UV Threads. Some embroidery threads have a reputation for being difficult to work with. Breakage during stitching is a common problem, and it’s tempting to blame the thread. But, more likely, a few slight adjustments to your sewing machine can make a big difference. Of course, sewing machines vary, but these handling tips should help you deal with most stitching problems. First, let’s talk about tension. Whenever you try a new thread, check your machine’s upper tension by sewing a 3-in.-long row of zigzag stitches on a scrap of the same fabric you plan to embroider, stabilizing and hooping it properly (for details on stabilizing and hooping, see Machine Embroidery: A Marriage of Fabric and Design by Lindee Goodall). The correct tension for machine embroidery should be slightly unbalanced, with a tighter bobbin tension, so the needle thread only shows on the surface, pulling slightly to the underside. If the needle thread totally covers the bobbin thread on the wrong side, the needle tension is too loose. Improperly balanced tensions can also cause “bird-nesting,” that pile of looped threads that forms under the fabric. If this happens, check to be sure the thread hasn’t slipped out of the take-up lever guide, check for lint between the tension discs, and clean these discs periodically. Sewing at high speeds can sometimes cause loose threads to get caught between the tension discs. Maintain clean upper tension by cutting your thread at the spool, instead of at the needle, when you change colors or complete a stitching sequence, then pull the thread down to remove it. Pulling the thread up can cause frayed ends to catch between the tension discs, possibly producing damage. Since thread continuously passes through the bobbin tension at high speeds, lint can accumulate and cause thread breakage there also, so clean inside and around the bobbin case often. Next, look at your machine’s thread-feeding system. In my experience, there’s no other single variable as critical to successful thread handling as the path the thread takes from spool to needle. If the thread is straight and unobstructed in this path, it’s less likely to misbehave. If you’re having problems, first check the spool pin: Some threads stitch better from a horizontal pin and others from a vertical pin. A horizontal pin may cause thread to spiral as it leaves the end of the spool, causing the thread to twist and possibly snap. With a vertical pin, the thread may slide down the edge of the spool, collect there, and become lodged underneath the end cap. The thread may even backspin, causing loops and uneven tautness. If you can’t adjust the position of your spool pin, try a device like the ThreadPro or Martha Pullen’s Thread Stand, which guide the thread so it unwinds straight and flat to the needle. I find the ThreadPro useful when embroidering with metallic threads, but it’s also helpful with any sewing and any thread when there’s only a small amount left on a spool. This thread is more tightly wound and may kink as it unwinds. Consider the direction in which the thread winds off the spool as well. For better stitching, cross-wound spools should feed off the top, and straight-wound spools should feed off the side. Also, some threads behave better when they unwind from the back of the spool, others from the front. If you’re having difficulty, try removing the thread and turning it around. 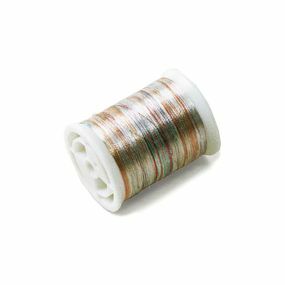 Bobbin threads especially designed for machine embroidery are strong enough to withstand the stress of high-speed stitching, yet fine enough to keep densely embroidered designs supple. 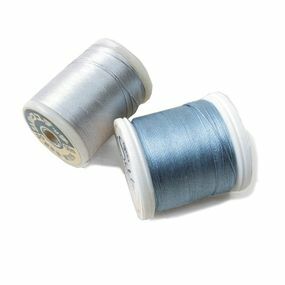 There are several types of bobbin threads, so I suggest keeping a variety of weights on hand because there is no single all-purpose bobbin thread that works equally well with all specialty embroidery threads. Generally speaking, it’s best to pair a needle thread with a bobbin thread of similar weight and fiber content. The fineness of these bobbin threads means more thread can be wound on the bobbin. Brands on the market include Madeira Bobbinfil, Mettler Metrolene, Sulky Bobbin Thread, and YLI Lingerie/Bobbin Thread. Fortunately, needle manufacturers have designed needles specifically for embroidery thread, some with specialized eyes that eliminate stripping or splitting the thread as it passes through them. Machine-embroidery needles by Schmetz or Madeira have slightly rounded points to avoid damage to rayon threads. Topstitching needles can also be used with most embroidery threads. And Sullivan’s Metafil, Madeira’s Metallic, and the Schmetz Metallica needles, for example, designed for metallic embroidery thread, have an elongated eye and a special shaft to reduce friction. Choose the needle size according to the weight of your fabric. An improperly sized needle or an old or nicked needle can cause thread to fray and break. Remember to replace needles often (I change mine after every five hours of sewing time). You may come across recommendations to use a silicone- or Teflon-based thread lubricant, which coats the thread to make it smooth and flexible, reducing friction and fraying and helping the thread glide easily through the needle. These products can work well, but before using any of them, be sure to check your machine manual. Some manufacturers clearly state that lubricants should not be used with their machines. Armed with these tips, you can be confident when using these wonderful specialty threads. And they’re sure to add excitement to your machine embroidery. Sharee Dawn Roberts is an award-winning free-motion machine embroiderer. Polyester embroider thread won't shrink, fade, or bleed. What are Your Favorite Embroidery Software Features? I have been doing machine embroidery for a long time...this article is a great refresher since there are so many more beautiful thread options out there. Thank you! I am brand new to embroidery. I just purchased the Brother SE 400 and will get it in about a week. I already have projects lined up. I love the dragonflies at the beginning of this forum. Can you tell me where I can get the design? can anyone comment on rayon ameth embroidery thead? just ordered brother P770 .This sight is very helpful in trying to decide what kinds of thread to ues. I have been sewing for over thirty years but never had an embroidery machine. I am very excited about this new adwenture. So much to learn!!!! AZITHROMYCIN is a really macrolide antibiotic that interferes as part of your growth of bacterial cells. It may be used to take care of bacterial infections in several areas of the body. Azithromycin also treats sexually transmitted vaginal or urinary tract infections as a consequence of chlamydia. It doesn't be employed by colds, flu, or other virus infections. AZITHROMYCIN can be a macrolide antibiotic that interferes that has the growth of bacterial cells. It is very used to begin treating bacterial infections in a variety of parts of the body. Azithromycin also treats sexually transmitted vaginal or urinary tract infections the effect of chlamydia. Be wasted be employed by colds, flu, or other virus infections. We use threads software (http://www.threadses.com) Its fully digitizing, lettering, editing -- basically everything. We are very happy with it and would recommend it. Very good post. I just bought a Brother Embroidery Machine and I want to pick the right thread for my machine.